In 2003, Rohrich et al noted that ultrasound-assisted liposuction (UAL) is a safe and effective method for the treatment of gynecomastia. The technique is particularly efficient in removing dense, fibrous breast tissue in men and produces minimal external scarring. Rohrich and colleagues proposed a new system of classification and graduated treatment, based on glandular versus fibrous hypertrophy and the degree of breast ptosis. Suction-assisted liposuction is the traditional method. In this type of liposuction, the surgeon removes fat by inserting a cannula that is connected to a vacuum pressure unit and directing the cannula through tiny incisions into areas to be suctioned. In power-assisted liposuction, a cannula (see the image below) with a back-and-forth motion of the tip passes through tissue to suction out fat and fibrous or scarred tissue with reduced effort. 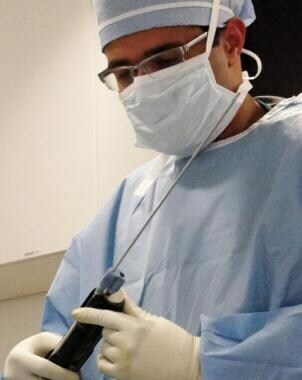 Surgeon Vishal Kapoor, MD and a power-assisted liposuction cannula. © James C. Mutter / Vishal Kapoor, MD. Image courtesy of Wikimedia Commons. The Vibration Amplification of Sound Energy at Resonance (VASER) System (Sound Surgical Technologies LLC, Louisville, Colo) is another method of liposuction. 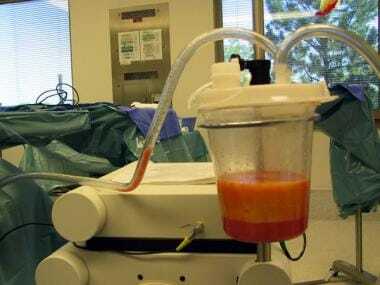 In VASER-assisted liposuction, intermittent or continuous bursts of ultrasonic energy can be used to break up fat cells, which are then removed by suction. See the images below. VASER probes with grooved tips. VASER ultrasonic liposuction machine including tumescent infiltrator, ultrasound generator, and suction with some aspirate in container. For information on various liposuction techniques, see the Body Contouring section of the Medscape Reference Plastic Surgery journal. The use of liposuction was first described in 1976 by Georgio and Arpand Fischer. Tumescent liposuction is also called standard liposuction, liposuction, lipoplasty, liposculpture, liposculption, and suction-assisted lipoplasty. This type of liposuction has been performed in the United States since 1982. First, the surgeon instills the fat with tumescent fluid (a solution that contains saline and local anesthetic with epinephrine). 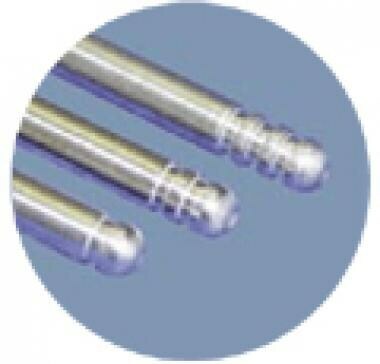 Following instillation of tumescent fluid, the fat is aspirated with long thin rods called cannulas. The suction can now be performed through a few small incisions, which can be hidden within natural skin creases. The tumescent technique may reduce blood loss and alleviate pain. The local anesthesia is frequently supplemented with intravenous sedation or general anesthesia. This type of liposuction is frequently performed as an outpatient procedure. Soft tissue injuries, orthopedic trauma, and pain relief for chronic pain conditions all can be treated with external ultrasound. The action of manual liposuction can be time-consuming and physically taxing. In this regard, ultrasound appears to offer the advantage of breaking up adipose tissue to facilitate liposuction and decrease postoperative pain. With internal UAL, areas of skin necrosis and seroma formation can occur. Therefore, interest has been garnered in the application of external ultrasound prior to liposuction. Theoretically, external ultrasound should soften or disrupt adipose tissue and (1) facilitate the task of suctioning adipose tissue, (2) make the patient more comfortable during and after the procedure, and (3) improve the quality of the aspirate by decreasing the amount of blood. External UAL is not widely used, and the evidence of its effectiveness is conflicting. [13, 14, 15, 1, 5] External UAL at lower intensity appears to be fibrinolytic and facilitates the loosening of cell-to-cell interactions; at higher intensities, it leads to destruction of adipose cell structure. External UAL is a type of UAL in which the ultrasonic energy is applied from outside the body, through the skin, making the specialized cannula of the internal UAL procedure unnecessary. While internal UAL can result in skin necrosis and seromas, external UAL can, in theory, avoid this potential complication by applying the ultrasound externally. External UAL is also potentially useful because (1) the external location of the ultrasound device can lead to less discomfort for the patient during and after the procedure; (2) the external location of the device means the probe does not physically touch internal tissue (blood loss can, therefore, be decreased); (3) it allows superior access through scar tissue; and (4) it is not constrained by internal structures and can, therefore, be used to treat larger areas. Ultrasound causes tissue destruction via 3 mechanisms: (1) cavitation, (2) micromechanical disruption, and (3) thermal damage. Articles on internal UAL largely attribute the destruction to unstable or transient cavitation. Reports on ultrasound suggest that the disruptive biologic effects of external ultrasound are due to micromechanical disruption or tissue heating. Other reports postulate that external UAL loosens adipose cell attachments, facilitating aspiration. Patients with localized increased adipose tissue benefit from liposuction. This condition is termed lipodystrophy, and, even if the patient is at or below his or her ideal weight, fatty tissue can be present in excess in specific areas. Overweight patients may also have lipodystrophy, but diet and exercise, rather than large-volume liposuction, are the mainstays of treatment for generalized obesity. The best liposuction results involve healthy patients with good skin elasticity and localized deposits of excessive fat. Good candidates for liposuction should have realistic expectations and should not be obese. Some patients must have multiple procedures if they have more fat than can safely be removed in one operative setting. In rare cases, patients can experience problems with the anesthesia. Ultrasonic liposuction appears most useful for treating larger or more fibrous areas that would be otherwise difficult with liposuction alone. External UAL allows much easier access through scar tissue. External UAL is especially appropriate for treatment of male breasts and retraction of the skin on the neck. In addition, high-frequency treatment of 2-3 MHz is recommended for treatment of fibrous and inveterate cellulitis. In 2004, Shi and colleagues reported external UAL performed on 500 patients (595 sites). The volume of anesthetic drugs, the volume of aspirated pure fat, and the body contour variations of every area were recorded at 1-3 months postoperatively. Both volumes were greatest in the waist-abdomen and thigh. The decreased postoperative dimensions at different body sites were then compared and analyzed; all dimensions were decreased to certain degrees. The most obvious decreases were in the severity of obesity and in the waist-abdomen; the decreases in the umbilical circumference and the minimum and maximum waist circumferences tended to be less. However, when the minimum waist circumference was >111 cm (50.45 in), obvious changes occurred in the umbilical region. The upper middle part of the thigh and the upper part of the arm showed larger variations than lower on either limb. In 2004, Zhang demonstrated that external UAL is a safe, effective, and simple method for liposuction in the upper legs. In this series, 32 patients underwent external ultrasound-assisted tumescent liposuction in the upper legs with local anesthesia. All patients had satisfactory weight reduction and leg shaping. No obvious complications occurred in these cases; all patients recovered smoothly and promptly. Adipose tissue is the tissue removed during liposuction procedures. The most common areas involved are the abdomen and thighs in women and the abdomen and flanks in men. Patients who are extremely obese or in poor health, especially those with cardiac problems, should not undergo external UAL. Only a limited amount of fat should be removed at each session, as very high volume lipectomy has been associated with development of pulmonary embolus and death. Some warn against performing liposuction around the neck and upper chest because of the possibility of creating depressions or noticeable cavities. Ultrasonic energy can theoretically cause air emboli; this possibility should be considered when selecting sites for the procedure. To date, this injury has not been reported. Heymans O, Castus P, Grandjean FX, Van Zele D. Liposuction: review of the techniques, innovations and applications. Acta Chir Belg. 2006 Nov-Dec. 106(6):647-53. [Medline]. Mendes FH. External ultrasound-assisted lipoplasty from our own experience. Aesthetic Plast Surg. 2000 Jul-Aug. 24(4):270-4. [Medline]. Sklar LR, El Tal AK, Kerwin LY. Use of transcutaneous ultrasound for lipolysis and skin tightening: a review. Aesthetic Plast Surg. 2014 Apr. 38 (2):429-41. [Medline]. Rosenberg GJ, Cabrera RC. External ultrasonic lipoplasty: an effective method of fat removal and skin shrinkage. Plast Reconstr Surg. 2000 Feb. 105(2):785-91. [Medline]. Ferraro GA, De Francesco F, Nicoletti G, Rossano F, D'Andrea F. Histologic effects of external ultrasound-assisted lipectomy on adipose tissue. Aesthetic Plast Surg. 2008 Jan. 32(1):111-5. [Medline]. D'Andrea F, Ferraro GA, Nicoletti GF, De Francesco F. External ultrasound-assisted lipectomy: effects on abdominal adipose tissue. Plast Reconstr Surg. 2008 May. 121(5):355e-356e. [Medline]. Rohrich RJ, Ha RY, Kenkel JM, Adams WP Jr. Classification and management of gynecomastia: defining the role of ultrasound-assisted liposuction. Plast Reconstr Surg. 2003 Feb. 111(2):909-23; discussion 924-5. [Medline]. Milanese C, Cavedon V, Piscitelli F, Zancanaro C. Effect of low-intensity, low-frequency ultrasound treatment on anthropometry, subcutaneous adipose tissue, and body composition of young normal weight females. J Cosmet Dermatol. 2014 Sep. 13 (3):202-7. [Medline]. Fischer A, Fischer GM. First surgical treatment for molding body's cellulite with three 5-mm incisions. Bull Int Acad Cosmet Surg. 1976. 3:35. Scuderi N, De Vita R, D'Andrea F. Nouve prospettive nella liposuzione: La lipoemulsificazione. G Chir. 1987. 2:1-10. Zocchi M. Ultrasonic liposculpturing. Aesthetic Plast Surg. 1992 Fall. 16(4):287-98. [Medline]. Silberg BN. The technique of external ultrasound-assisted lipoplasty. Plast Reconstr Surg. 1998 Feb. 101(2):552. [Medline]. Lawrence N, Coleman WP 3rd. Ultrasonic-assisted liposuction. Internal and external. Dermatol Clin. 1999 Oct. 17(4):761-71. [Medline]. Lawrence N, Cox SE. The efficacy of external ultrasound-assisted liposuction: a randomized controlled trial. Dermatol Surg. 2000 Apr. 26(4):329-32. [Medline]. Cardenas-Camarena L, Cardenas A, Fajardo-Barajas D. Clinical and histopathological analysis of tissue retraction in tumescent liposuction assisted by external ultrasound. Ann Plast Surg. 2001 Mar. 46(3):287-92. [Medline]. Hughes CE 3rd. Patient selection, planning, and marking in ultrasound-assisted lipoplasty. Clin Plast Surg. 1999 Apr. 26(2):279-82; ix. [Medline]. Shi B, Li WZ, Li XY, Chen SZ. [500 cases of external ultrasound-assisted liposuction]. Zhonghua Zheng Xing Wai Ke Za Zhi. 2004 Mar. 20(2):86-9. [Medline]. Zhang XH. [Application of external ultrasound-assisted tumescent liposuction in upper legs]. Di Yi Jun Yi Da Xue Xue Bao. 2004 Nov. 24(11):1331-2. [Medline]. Gadsden E, Aguilar MT, Smoller BR, Jewell ML. Evaluation of a novel high-intensity focused ultrasound device for ablating subcutaneous adipose tissue for noninvasive body contouring: safety studies in human volunteers. Aesthet Surg J. 2011 May 1. 31(4):401-10. [Medline]. Johnson DS, Cook WR Jr. Advanced techniques in liposuction. Semin Cutan Med Surg. 1999 Jun. 18(2):139-48. [Medline]. Shalom A, Wiser I, Brawer S, Azhari H. Safety and tolerability of a focused ultrasound device for treatment of adipose tissue in subjects undergoing abdominoplasty: a placebo-control pilot study. Dermatol Surg. May 2013. 39(5):744-51. [Medline]. Disclosure: Serve(d) as a speaker or a member of a speakers bureau for: Allergan; Inmode; Biom'up. The authors and editors of Medscape Reference gratefully acknowledge the contributions of previous authors Noah S Scheinfeld, MD, JD, FAAD, and Marc S Zimbler, MD, FACS, to the development and writing of this article.